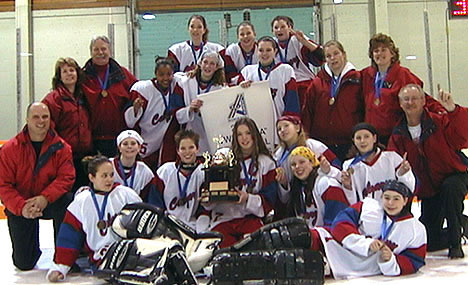 Ringette Calgary and the AA Foundation submitted a bid to host the 2004 Canadian Ringette Championships. 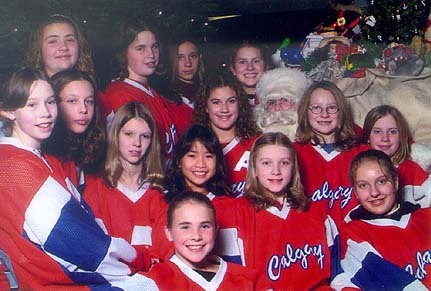 For the 2001-2002 season, the Ringette Calgary logo was refreshed by Laura Webb. Petite AA Storm - Gold, Petite AA Mission - 4th, Tween AA Elite - Bronze, Tween AA Blaze - Silver, Junior AA Summit - Bronze, Belle AA Ignite - Bronze, Open AA Extreme Danga - 2nd. At the Regina AA tournament the Tween AA Blaze won Gold and the Open AA Extreme Danga won silver. Iveah and Steve Hutchison received the AA Committee volunteer award. We regretfully announce the passing of Linda Anderson, née Tippin, on April 18, 2002 as a result of a motor vehicle accident. At the time of her passing, Linda was only 43 years old, married to Luke, and mother of Cameron (6) and Christopher (4). She is also survived by her parents, Lillian & Mac, her brothers Scott, Chris and families, and by many friends across the country. 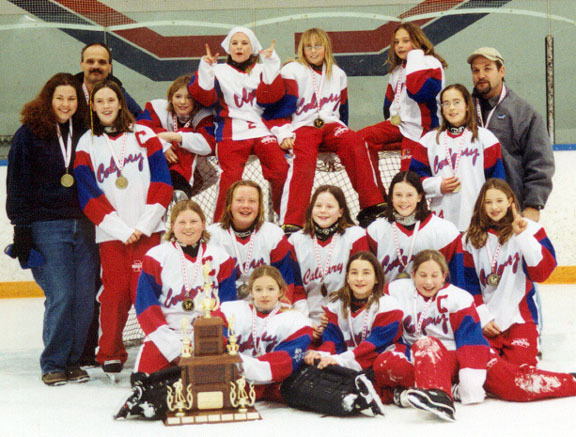 Linda started her ringette career in Kitchener, Ontario in the 1970's and played in the first Canadian Ringette Championships in Winnipeg in 1979 on the gold-medal winning Kitchener Deb team. 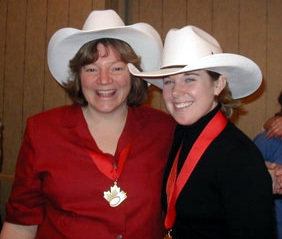 She moved to Calgary in 1981 where she played, coached and instructed ringette for many years. 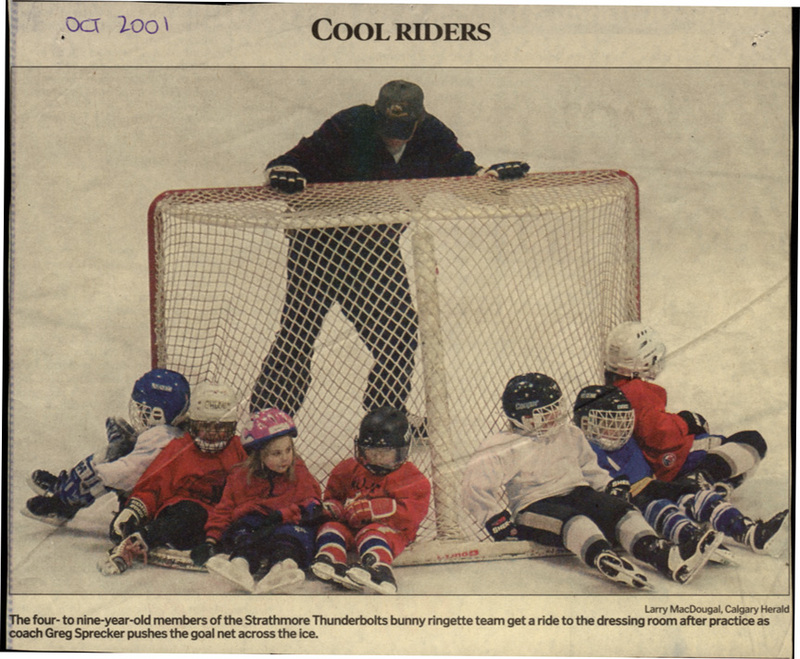 Over her 30 year ringette career she was involved in playing, coaching, coaching clinics, player development clinics, camps/schools, and in the development of resource materials - including much of the content of the "Ringette Drill Manual". 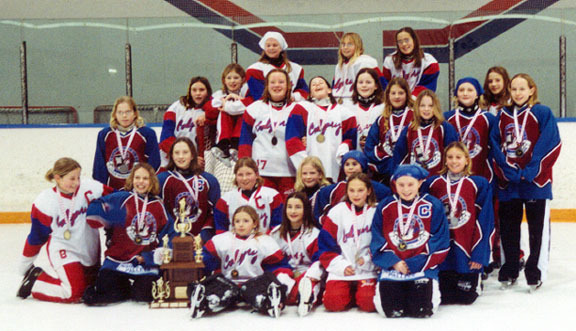 Memorial services were held for Linda in both Kitchener and Calgary on Saturday, May 11, 2002. 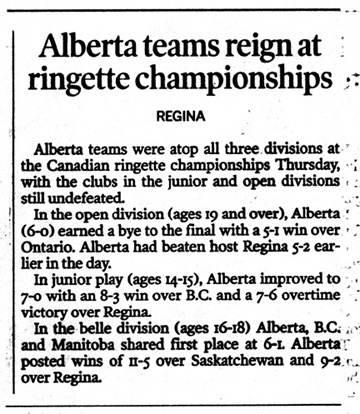 The Canadian Ringette Championships were held in Regina, SK. Calgary Summit Junior AA won Gold. 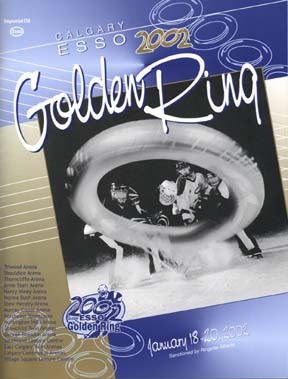 The 16th annual Esso Golden Ring was held Jan. 18-20, 2002 and hosted Bunny through Intermediate divisions. There were 169 teams in 16 different divisions. The tournament was sponsored for the sixteenth year by Imperial Oil Limited. Teams from Alberta, British Columbia, Saskatchewan, Ontario and Manitoba took part in the three-day competition. 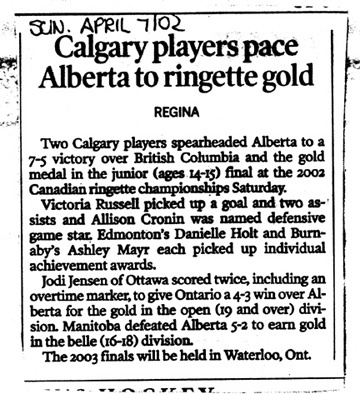 In addition to the 67 Calgary teams there were 76 teams from other parts of Alberta, and 27 out of province teams - 10 from British Columbia, 10 from Saskatchewan, 2 from Ontario, and 5 from Manitoba. A total of 183 applications were received for the tournament. The tournament committee was able to accommodate 169 of those teams, but unfortunately had to turn away 14. There were a total of 336 Games (453 hours of ice). The ice bill was $42,000. Committee members accumulated 338 draw prizes for players (2 for each team), including 200 custom-made powder blue stinger sticks. 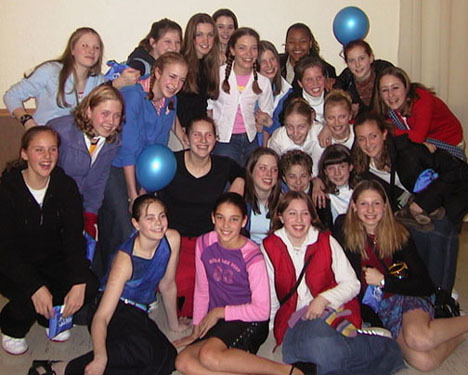 All participants also received 2002 Esso Golden Ring skate towels and lapel pins. Over 9500 items were given away to players in the coaches packages. All bunny teams received participation medals for their friendship series. Participants, coaches and those back home were able to check game scores on the website - for the first time scores were uploaded over the weekend using a laptop and a cell phone. The Hospitality Night was held Friday January 18th at Marlborough Community Hall, and was again presented as a carnival. Activities included kareoke, a radar gun to test shot speeds, carnival games, cotton candy, hot dogs, snow cones and lots of fun. The Junior, Belle and Open AA divisions used SHOT CLOCKS for all of their games. There were 22 tournament committee members, who opened arenas as early as 5:45 am, and closed as late as 1:00 am. The "control centre" was located at East Twin and was staffed with committee members and volunteers all weekend who circulated game scores, compiled results, verified gamesheets and generated pre-printed gamesheets for all games. Gamesheets for each game (regardless of location) were shuttled by volunteers to East Twin arena for verification. Customized Esso Golden Ring Game sheets were used once again. Committee members were linked by cellular phones donated by Fido, and averaged more than 500 km of driving over the weekend each. In addition to the tournament committee, there were 250 arena volunteers from Calgary teams, 12 shot clock volunteers, and 130 volunteers who were minor officials at the 41 semi and final games. Referee game fees for the tournament total $9200. The cost of "importing" referees and transporting them was an additional $3500. Thanks to Cathy Over for generating the referee schedule, and to Robyn Schweitzer for her assistance. A van was provided to transport out of town officials to all of their games. (thanks to Murray Todd who drove the van, and to Lonnie Krahn for his assistance in the "peak" times. 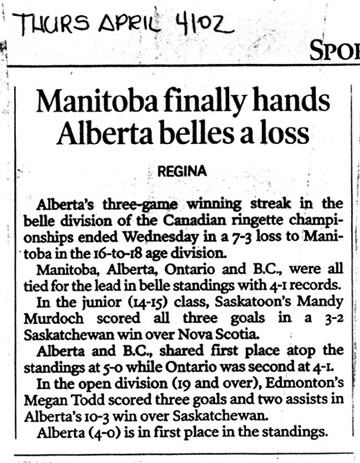 Beth Veale and Jodi Jensen at the Canadian Ringette Championships.